Home > Fire Safety & EMS > Fire Extinguisher Inspection Tags, Labels & Fasteners > Aluminum Fire Department Connection Sign - 6" x 4"
Home > Fire Extinguisher Inspection Tags, Labels & Fasteners > Aluminum Fire Department Connection Sign - 6" x 4"
Clearly mark your fire department connections with these aluminum 6" x 4" FDC Signs. 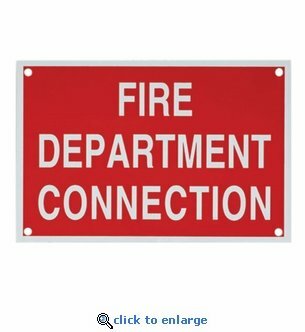 These red signs with white letters spell out "Fire Department Connection" and are silk screen printed on heavy gauge aluminum, then oven-baked for extra durability. The metal signs feature pre-drilled mounting holes, rounded corners and smooth finished edges. Perfect for mounting on block or concrete walls. 7 or more qualify for Free Shipping.